Hi! 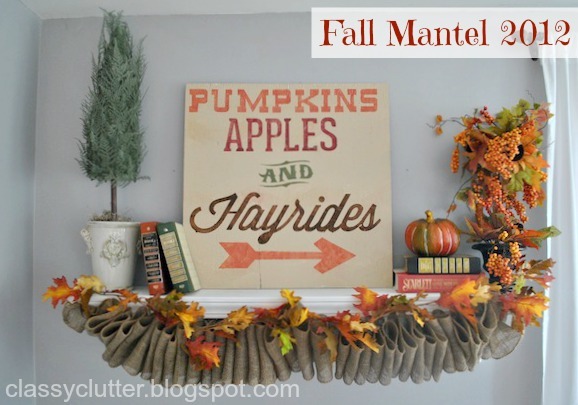 I finally finished my fall mantel! Well, my shelf. ha! I don’t have a real mantel so I use my Ballard inspired shelf I made as my mantel in my living room. 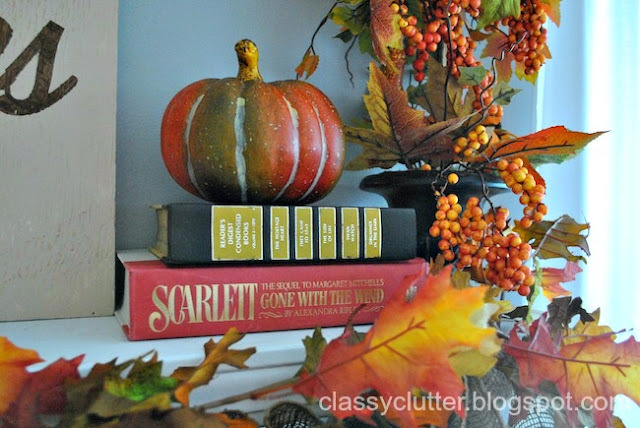 I wanted to do a traditional looking mantel that would last all of October and November. 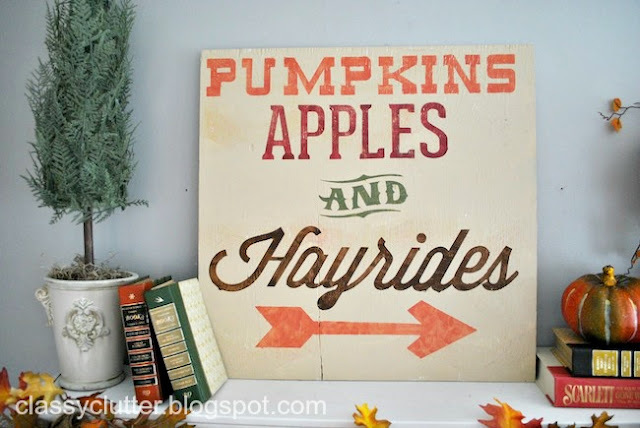 One of my favorite things about Fall is the gorgeous color that is everywhere! I love the oranges, golds, reds and browns! I saw this sign on Ella Claire blog and knew I really wanted a similar one. I used my Silhouette to make a vinyl stencil, stuck it on the painted board and painted the letters with acrylic craft paints. When it was almost dry, I peeled off the vinyl and voila! Easy! I also sanded it when everything was dry to get a more rustic look. The fall foliage topiary was a 90% off find at Hobby Lobby last winter. I think I paid $4 for it! SCORE! The pumpkin too. It was less than a $1 with the 90% off discount! 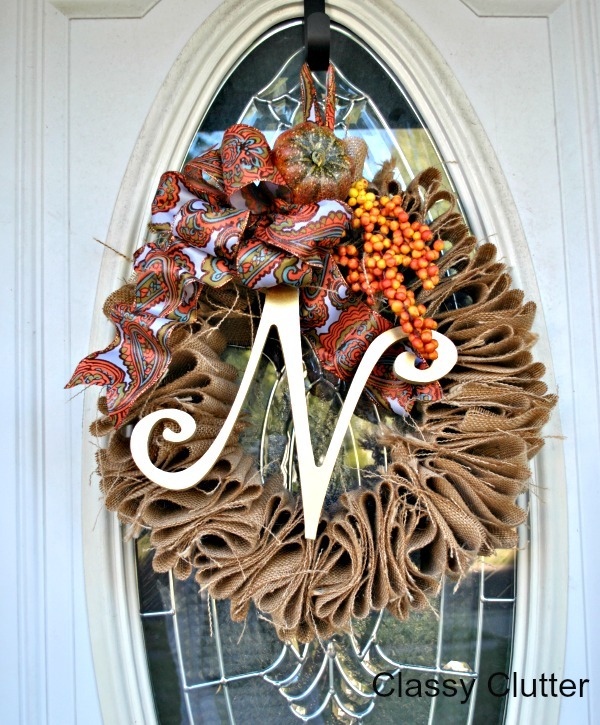 Seriously, stock up after Thanksgiving on your fall decor. Hobby Lobby has crazy cheap prices for their cute stuff! The books came from the thrift store for $.89 each. I think they bring a lot of character to the display. 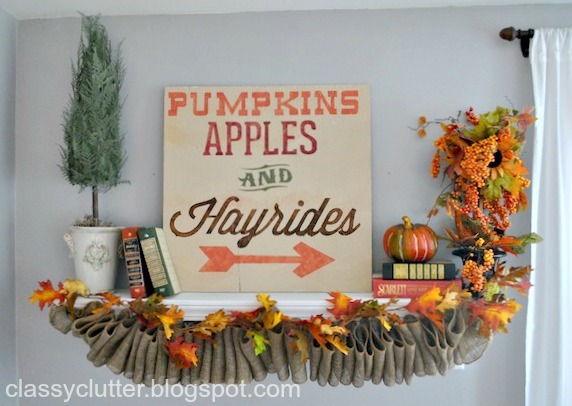 I made the ruffled burlap garland and it was a pretty cheap/quick project. It really is super simple! 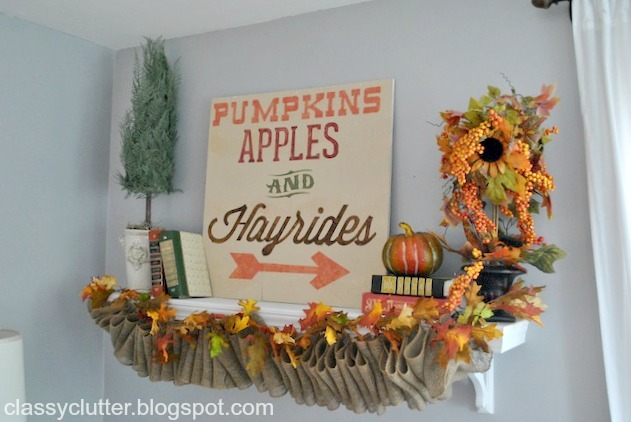 The roll of burlap garland was from Joann’s and it is $8.99 and I used a 50% off coupon. I used one roll for my ruffled garland and it made about 5-6 feet of ruffled garland once it was all put together. First, you get a thin piece of ribbon or you could use jute or twine. 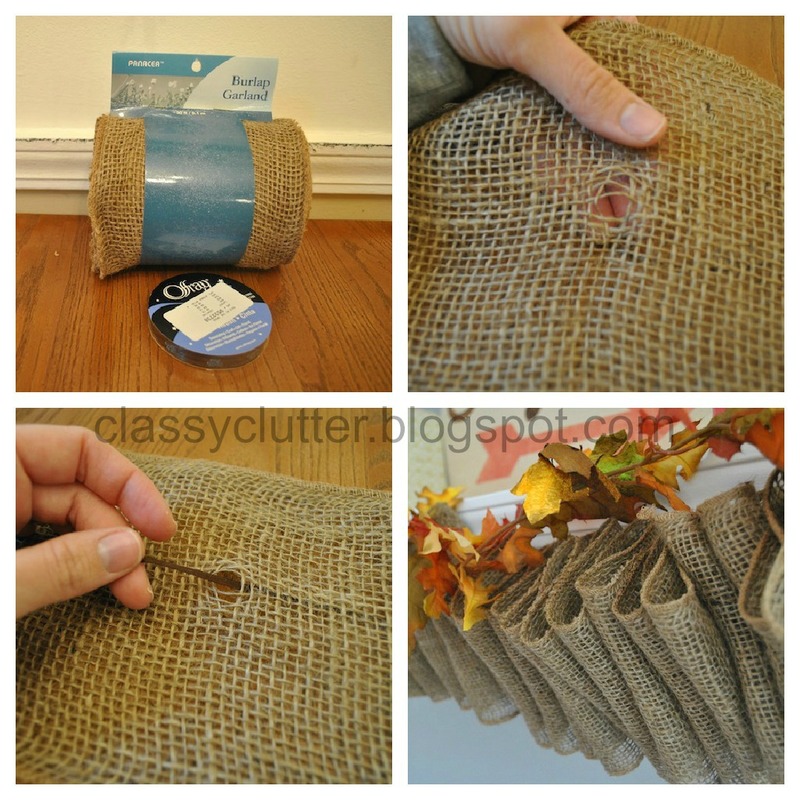 I simply made a tiny hole about every 4-5 inches by spreading the weave and fed the ribbon through over-under-over-under… the entire length of the burlap roll. The ribbon fits well through the weave and was $1 at Joann’s. That’s it! I spent under $20 and I think it turned out really cute! I debated on doing a Halloween mantel for October and the Fall mantel for November but with all the fun stuff I’m doing to get ready for baby boy #3, I think one mantel will work just fine. Do you like it? What’s your favorite part? 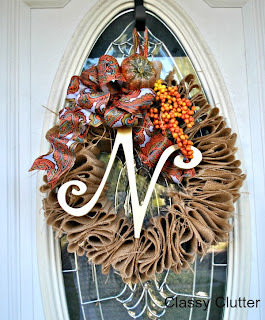 If you liked this post, check out my $5 Fall Burlap Wreath tutorial here. Love love love your mantel 🙂 Your version of my sign turned out so great! Very smart to use the sillhouette for a stencil! Thanks for the inspiration Kristen! …and thanks a million for stopping by our blog! I don’t normally like garlands, but I LOVE this! Looks so great. Thanks for sharing at the Under $10, Under 1 hour party. This is seriously TOO CUTE! I love everything about it! I would have never thought to use vintage books but boy, do they look awesome on there! Way to go Mallory! You’re always inspiring me!! love it Mal! Looks great! That looks great! I didn’t know they sold burlap like that. 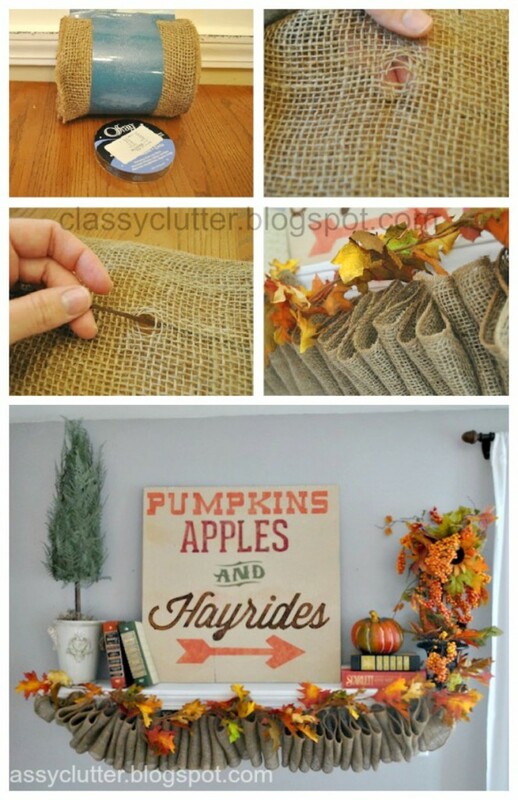 Since you didn’t glue or cut the burlap at all you could use it for something else another time! So adorable! 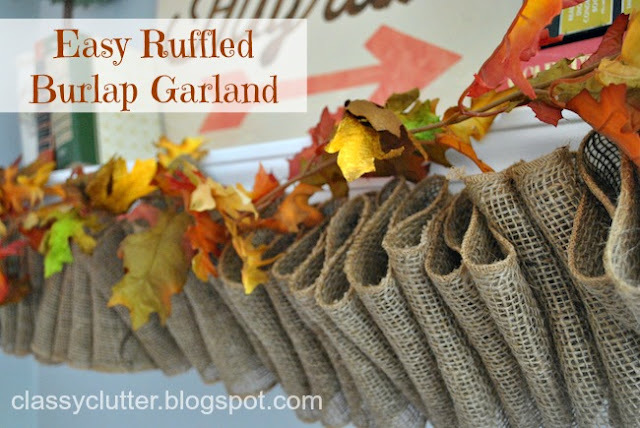 The ruffle burlap garland is gorgeous! Your mantel/ shelf is gorgeous! Love that garland. I love that sign! The whole mantel looks fantastic. Great job! Any chance you would consider a printable of the sign?